Properties in Sorins Bluff average 4.8 out of 5 stars. Quaint seclusion, steps from the backwaters of the Mississippi. Property 1: Quaint seclusion, steps from the backwaters of the Mississippi. APRIL DISCOUNT!! Start Spring with a FABULOUS view of the Mississippi. Property 2: APRIL DISCOUNT!! Start Spring with a FABULOUS view of the Mississippi. Cozy cottage great for girlfriends or romantic couples getaways! Property 5: Cozy cottage great for girlfriends or romantic couples getaways! Property 6: Swanny Oaks. Character with modern comfort. 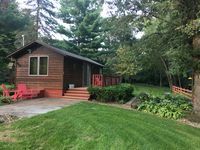 Property 10: Charming Spacious Cottage, Steps from Lake Pepin & Downtown! 2 level, 2 bedroom/2 bath filled with windows framing amazing water views! Property 17: 2 level, 2 bedroom/2 bath filled with windows framing amazing water views! Property 22: Franklin House - Walk to Lake Pepin or Downtown Lake City! Stunning Historical Mansion: 8 bedrooms (sleeps 16+). Property 33: Stunning Historical Mansion: 8 bedrooms (sleeps 16+). Farmhouse Inn - beautiful 1917 farmhouse set on 150 acres of farmland. Property 36: Farmhouse Inn - beautiful 1917 farmhouse set on 150 acres of farmland. Property 42: Fantastic large family home right on beautiful Lake Pepin! Awesome retreat outside Twin Cities! Great space for a reunion! Comfortably slept 8 with plenty of space to relax during the day (living room, dining room w/ large table, breakfast nook). Large kitchen as well. Definitely hope to come back again!! Enjoyed this little cabin in the woods! Was a great get away but still close to town.